Golden retriever is one of the best dogs for families and kids. The Goldens are full of energy, and love playing games with humans. Their trainability as well as their intelligence and obedience makes them one of the most awesome dogs on the Earth. Other than being kept as pets, Golden Retrievers are also used as guide dogs and security dogs. Some of them also serve in military. However, in order to train a Golden Retriever, it is better to take them home or start training since they are puppies. 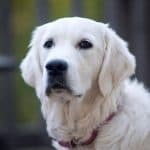 Twelve weeks of age is a critical time to get your Golden Retriever familiarize with the settings or your families. 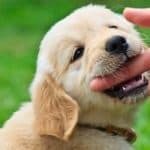 There are many aspects of taking care of a 12-week-old Golden Retriever: from the feeding, grooming, to the training, and so on. 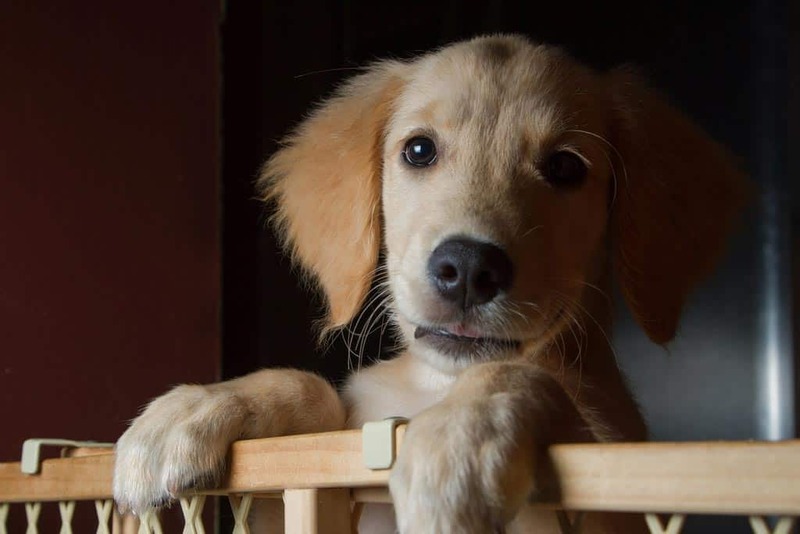 So let’s take a look at some aspects below to get a better idea of how to raise a Golden pup. YOUR PUPPY NEEDS EXERCISING TOO! The need for food varies during a dog’s lifetime. Just think about us, humans, for a second. A baby surely has different food and nutrition needs compared to adolescents and adults. As we grow older, our bodies change and we may eat differently. The same principle applies for dogs. When they are puppies, they require food at certain times of the day. For a 12-week-old Golden Retriever, you should feed him four times a day. The amount of food varies depending on the dog’s weight, but on average the amount of food for a 12-week pup is about one-third to half of a cup of dry food. Feeding is one of the most essential things you need to know once you bring the puppy home, and it’s not just about giving food to your dog. There are many important rules that you need to follow, in order to make the eating as easy as possible for your little Golden. The location where you place the food matters. The location should be the same every meal so that your dog feels familiarized and comfortably eats his food. It should also be a quiet place with minimal distractions. Do not forget to pay attention to the amount of food given. Remember that the amount of food consumed varies from dog to dog, so if there is leftover, try to cut down the food amount next time. Choose proper food for your puppy. There is a difference between puppies’ food and adult dogs’ food. Therefore, when you shop for dog food, pay close attention to the label and make sure it is food for puppies. Obviously, dogs need water too, not just food. It is vital to give your dog good quality water along with quality food. Fresh and clean water is necessary for your dog, and it should available to your pup at all times. If the water gets dirty, change the water. It is recommended that you change the water at least once a day. Some dog owners prefer using stainless steel bowls to contain water to plastic ones because the metal ones are less prone to bacteria, which is better for your puppies. Thus, this is a good suggestion if you are wondering which water container you should use for your dog. Although the coat of a puppy is not as long and thick as an adult’s, regular grooming is still required. 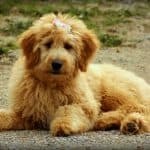 Golden Retrievers possess long coats that need regular grooming and brushing to prevent matting, thus it is important to have your puppy get used to brushing from a young age. When brushing your dog, make sure that you brush all of body areas such as neck, chest, ears, tail, and so on. As you go through the coat, pay close attention to any abnormality such as lumps or bumps. These can be a sign of an illness, so keep an eye on them for a few days and see if they are gone. If not, do not hesitate to consult a veterinarian immediately. One thing that you need to keep in mind is that shaving is highly restricted for Golden Retrievers. Some dog owners mistakenly think that shaving would keep the puppy cool, especially in hot weather such as summer. 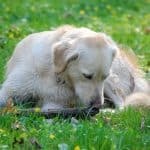 However, this is dangerous for your dog because the Golden Retriever needs its two layers of coat for water-resistance. If you think that a pup does not need exercising, you may want to think again. In fact, younger dogs require more exercising and activities than the elders. Hence, it is crucial to take your little Golden Retriever for a walk for few times per day or play some games with him to release his energy. Playing games is also a good time for your puppy to socialize with you and your family members, so that he can get to know all of you over time. One common game that you can play is fetch. Remember how they are called “retrievers”? Fetching probably is one of games that they are best at. They will definitely enjoy running and catching a tennis ball or a Frisbee while playing with you. You can also take your puppy to other activities as well such as swimming. Dogs are good swimmers. So do Golden Retrievers. They enjoy the water as much as the land. If you live near a lake or have a pool at home, you can totally take your dog to those water areas for him to swim around and enjoy the water. However, remember that the water should be clean, and the depth is safe for your puppy. Don’t forget to keep an eye on him at all times. At 12 weeks old, your dog is still little but yet is able to learn a lot. This is a good time to train your dog so that he will get used to your home and establish his habits. One of the very first things that you want to train your puppy is to go potty at a designated place. Refrain from yelling at your puppy. There is first time for everything, so take your time and be patient with your dog. Sometimes, it takes a couple of messes to have your dog familiarized with the place. Make sure that the place remains unchanged. Don’t forget nice treats and praises for your puppy as he loves it. After your puppy establishes his habit, you can start teaching him some basic commands. When it comes to training, remember to use treats as a positive reinforcement. No matter if you have a puppy or an adult dog, positive reinforcements always work better than negative ones such as yelling or hitting the dog. Having a Golden Retriever in your household can be a life-changer. You will definitely have great moments together, but it also takes time and effort to set things up for your puppy, as well as to establish new habits and routines for your puppy. Nevertheless, this effort will totally pays off. After these first few steps, things would become easier for you.